Founded in 1992 by Eng. 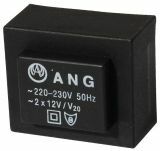 Hristo Angelov, ANG company is a reputable Bulgarian manufacturer of various types of transformers, adapters and switching power supplies. In their production, ANG are using only premium quality materials from leading brands such as: Bayer, Camattini, Kashke, Dahmen and others. All ANG products comply with CE and therefore can guarantee reliability and safety to all of its customers. In terms of manufacturing, the company work with high quality winding machines for voltage, current and toroidal transformers, but also own a fully closed production cycle for adapters with ANG own unique design, which further highlights the great professionalism of the ANG team and their 100% percent control over the entire production process. 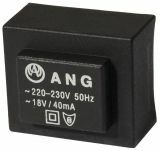 With more than 20 yearsin this field, ANG holds a major share of the market for power supplies in Bulgaria, while the high quality voltage, current and toroidal transformers allows them to attack the European and world markets as well. VIKIWAT Ltd. is an authorized distributor of ANG and offers a wide range of encapsulated transformers and PCB transformers. In our online and offline stores you will find a variety of current and toroidal power transformers in stock with competitive prices and fast delivery. PCB Transformer 6 VAC, 1.3 VA Low-powered transformer for PCB mount with secondary voltage of the secondary winding 6 VAC and power 1.3 VA, encapsulated in fireproof plastic box and galvanically separated primary and secondary winding. List Price 5.20лв. VAT Incl. 4.94лв. VAT Incl. 4.68лв. VAT Incl. 4.42лв. VAT Incl. PCB Transformer 7.5 VAC, 1.3 VA Low-powered transformer for PCB mount with secondary voltage of the secondary winding 7.5 VAC and power 1.3 VA, encapsulated in fireproof plastic box and galvanically separated primary and secondary winding. List Price 5.20лв. VAT Incl. 4.94лв. VAT Incl. 4.68лв. VAT Incl. PCB Transformer 9 VAC, 1.3 VA Low-powered transformer for PCB mount with secondary voltage of the secondary winding 9 VAC and power 1.3 VA, encapsulated in fireproof plastic box and galvanically separated primary and secondary winding. PCB Transformer 13 VAC, 1.3 VA Low-powered transformer for PCB mount with secondary voltage of the secondary winding 13 VAC and power 1.3 VA, encapsulated in fireproof plastic box and galvanically separated primary and secondary winding. PCB Transformer 15 VAC, 1.5 VA Low-powered transformer for PCB mount with secondary voltage of the secondary winding 15 VAC and power 1.5 VA, encapsulated in fireproof plastic box and galvanically separated primary and secondary winding. PCB Transformer 16 VAC, 1.3 VA Low-powered transformer for PCB mount with secondary voltage of the secondary winding 16 VAC and power 1.3 VA, encapsulated in fireproof plastic box and galvanically separated primary and secondary winding. PCB Transformer 18 VAC, 1.3 VA Low-powered transformer for PCB mount with secondary voltage of the secondary winding 18 VAC and power 1.3 VA, encapsulated in fireproof plastic box and galvanically separated primary and secondary winding. PCB transformer 2 x 5.8 VAC, 1.3 VA Low-powered transformer for PCB mount with secondary voltage of the secondary winding 2 x 5.8 VAC and power 1.3 VA, encapsulated in fireproof plastic box and galvanically separated primary and secondary winding. PCB Transformer 2 x 12 VAC, 1.3 VA Low-powered transformer for PCB mount with secondary voltage of the secondary winding 2 x 12 VAC and power 1.3 VA, encapsulated in fireproof plastic box and galvanically separated primary and secondary winding. PCB Transformer 230/ 9 VAC, 2 VA Low-powered transformer for PCB mount with secondary voltage of the secondary winding 9 VAC and power 2 VA, encapsulated in fireproof plastic box and galvanically separated primary and secondary winding. List Price 4.80лв. VAT Incl. 4.56лв. VAT Incl. 4.32лв. VAT Incl. PCB Transformer 230/ 18 VAC, 2 VA Low-powered transformer for PCB mount with secondary voltage of the secondary winding 18 VAC and power 2 VA, encapsulated in fireproof plastic box and galvanically separated primary and secondary winding. PCB Transformer 230/6VAC, 6VA Low-powered transformer for PCB mount with secondary voltage of the secondary winding 6 VAC and power 6 VA, encapsulated in fireproof plastic box and galvanically separated primary and secondary winding. List Price 7.25лв. VAT Incl. 6.88лв. VAT Incl. 6.52лв. VAT Incl. 6.16лв. VAT Incl. PCB Transformer 230 / 8.4 VAC, 6 VA Low-powered transformer for PCB mount with secondary voltage of the secondary winding 8.4 VAC and power 6 VA, encapsulated in fireproof plastic box and galvanically separated primary and secondary winding. PCB Transformer 230/9 VAC, 6 VA Low-powered transformer for PCB mount with secondary voltage of the secondary winding 9 VAC and power 6 VA, encapsulated in fireproof plastic box and galvanically separated primary and secondary winding. PCB Transformer 230/12 VAC, 6 VA Low-powered transformer for PCB mount with secondary voltage of the secondary winding 12 VAC and power 6 VA, encapsulated in fireproof plastic box and galvanically separated primary and secondary winding. List Price 7.90лв. VAT Incl. 7.50лв. VAT Incl. 7.10лв. VAT Incl. 6.71лв. VAT Incl. PCB Transformer 230/14 VAC, 6 VA Low-powered transformer for PCB mount with secondary voltage of the secondary winding 14 VAC and power 6 VA, encapsulated in fireproof plastic box and galvanically separated primary and secondary winding. PCB Transformer 230/15 VAC, 6 VA Low-powered transformer for PCB mount with secondary voltage of the secondary winding 15 VAC and power 6 VA, encapsulated in fireproof plastic box and galvanically separated primary and secondary winding. PCB Transformer 230/ 18 VAC, 6 VA Low-powered transformer for PCB mount with secondary voltage of the secondary winding 18 VAC and power 6 VA, encapsulated in fireproof plastic box and galvanically separated primary and secondary winding. PCB Transformer 230/21 VAC, 6 VA Low-powered transformer for PCB mount with secondary voltage of the secondary winding 21 VAC and power 6 VA, encapsulated in fireproof plastic box and galvanically separated primary and secondary winding. PCB Transformer 230/ 24 VAC, 6 VA Low-powered transformer for PCB mount with secondary voltage of the secondary winding 24 VAC and power 6 VA, encapsulated in fireproof plastic box and galvanically separated primary and secondary winding.